When riding the Interstates, Americans like to have their cake and eat it too. We want the convenience and safety of a modern, high speed highway. But often, we do not want to settle for the corporate franchises found at the on/off ramps. We want unique experiences. If you are traveling on Interstate 81 through the Syracuse area, a stop at Jake Hafner’s allows you to have your cake - - and your salad, and your steak, and your chicken - - and eat it too. 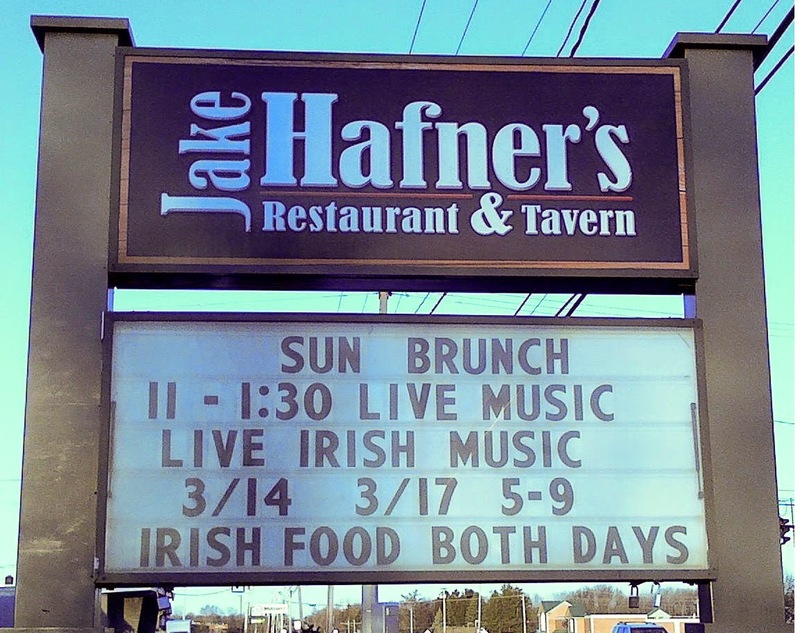 Hafner’s is a comfortable restaurant with a rustic ambiance in North Syracuse, a straight, five minute ride from the East Taft Road interchange on I-81. On the Syracuse Convention and Visitor’s Bureau website, Hafner’s cuisine is classified as “American Mixed.” The heart of its menu are wonderful steaks. However, the comprehensive menu includes a great selection of: dinner and appetizer salads; seafood; and chicken. On a recent Wednesday evening, we had dinner at Hafner’s. The place has a large dining room on one side and a big bar area with lots of flat screen televisions and sports programs. My friend Mark made a reservation for the restaurant so everyone could talk and not have to compete with the high spirits in the bar. We were seated in an intimate corner of the dining room. The table was amazingly cozy for a large party; the acoustics were such that it was easy to have a conversation - - even with the liveliness of the bar nearby. After a large lunch, I chose a steak frites dinner salad. It had sliced filet mignon, fresh field greens, blue cheese and an Everest-sized mound of frites, small crispy French Fries that were thinner than the shoestring potatoes found in burger places such as In ‘n Out. While this was a great dinner, all around me were other dinners equally delightful: a chicken Marsala dish with thinly sliced chicken breasts, a solid-sized Delmonico and a pasta Alfredo dish. As dinner wound down, trivia night started and we could easily hear the questions announced in the bar. By the time we got to the final question, our team had a respectable 75 points. We bet it all on the last question, which turned out to be a one of the geekiest and hardest questions about Star Wars you could imagine. We may have lost all our trivia points, but we still won big, with excellent food and capable, congenial service. Thanks to Seymour Singer for his help taking the blue of this photo! IN AN OUT reference woot woot! glad it was an enjoyable find, seems like a best kept secret! Excellent! And how is their brodetto alla Sanbenedettese? Thanks to both of you for reading. "Brodetto alla Sanbenedettese . . . " I haven't tried that yet. If it's not funny food, I will look for it on the menu next time.